NEW FOR 2018: the Black ‘Chrome‘, which features a satin inset notch lapel. You’ve got to feel it to believe it! 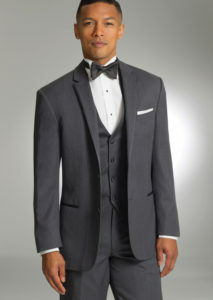 In 2014, Michael Kors debuted their Black ‘Desire‘ and Charcoal ‘Eternity‘ slim fit tuxedos. These two styles were a must for the Tuxedo by Sarno collection. The following year we added the new Charcoal ‘Destiny‘, which features a full black satin shawl lapel. In 2017 we added the Light Grey ‘Chrome‘ and the Black ‘Raven‘. 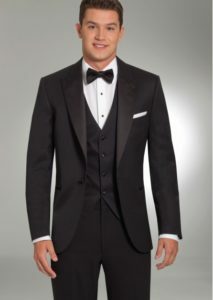 Michael Kors is one of the best luxury tuxedo brands available because of its super 130’s fabric and slim fit cut. 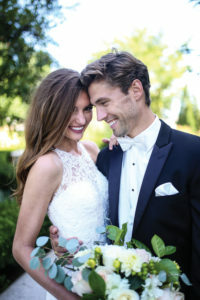 Our brides and grooms have made it one of our most popular styles, as the tuxedos pair well with colored ties, classic black or monochromatic grey ties.